The image above is of the Walkers crisp factory in Beaumont Leys in Leicester, taken from Bradgate Park by Phil McIver. note: You’ll see from the link to the Forbes List that it includes tobacco companies, which I find a tad bewildering. Nonetheless, there are important lessons to learn from their presence on this list. I’ve only included one, Altria, and on the somewhat spurious reason that they’re not exclusively tobacco company as they own a wine company. But their business is tobacco, notably ‘smokeless’ tobacco products. More about this at the end of the blogpost. Back to the list: Are all these companies supplying nutritious food to the population? Nope, they are not. How can we identify companies who are not in the business of supply nutritious food from those who are? As I’ve pointed out before VAT gives us a useful identifier. Food and drink is zero-rated for VAT — except for those categories of products that have low or zero nutritional value (other than perhaps calories). These categories which carry standard-rate VAT, currently 20%, are confectionery, most drinks (not milk of course as it’s nutritious), savoury snacks such as crisps, biscuits and a few others such as some ice-creams. Look again at the list above, and ask yourself which of these big companies exclusively or largely supplies standard-VAT rated products? By my count, seven of them do. (Kraft Heinz, Archer Daniels Midland and Danone being the exceptions — and these have some VAT-rated products. 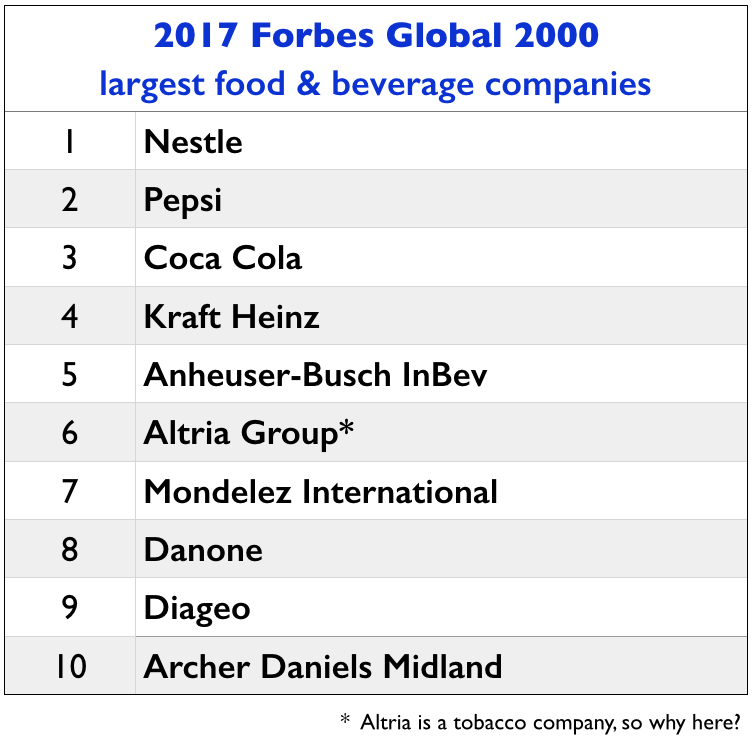 Yet the fastest growing part of Danone’s business is in bottled water (e.g. see this 2017 Economist article). There are significant social — and therefore ethical implications of these large corporations being the most profitable in the sector. They’re using up scarce global resources such as soils, water and energy which are needed to produce sufficient safe, nutritious food for the world’s growing population. It’s because I want to take the opportunity to ask how we should treat corporations that sell products that do medical or social harm. We treat tobacco companies by banning their adverts, and there is a UK Code of Practice on tobacco industry funding to universities. Should we have similar bans, a similar Code of Practice, for companies who sell ‘food’ (edible) and beverage products that carry standard-rate VAT? And, as has been suggested to me recently, should these corporations pay a tax on turnover, to be allocated to the local institutions, such as NHS Trusts and local authorities, that are burdened with the costs of meeting the medical and social care costs of their consumption? note: The next blogpost in this series is Part III — Vested interests.